Pregnancy is a time when women have many cravings but controlling these urges and being careful about diet can be very beneficial for the baby because the food she consumes directly affects her baby. Large fish contain high amounts of mercury that can be harmful for the baby as it causes damage to their brain and nervous system. Fresh water fish like shrimp, salmon and canned tuna contain relatively low levels of mercury and can be consumed in limit. Eggplant commonly called brinjal should be taken in small quantities and not on a regular basis. Drink only pasteurised milk after boiling slightly so that any germs and microbes which cause diseases are eliminated. Dry nuts like almonds and raisins can be consumed in moderation but sesame seeds are a no because it stimulates the uterine muscles and is believed to cause abortions. 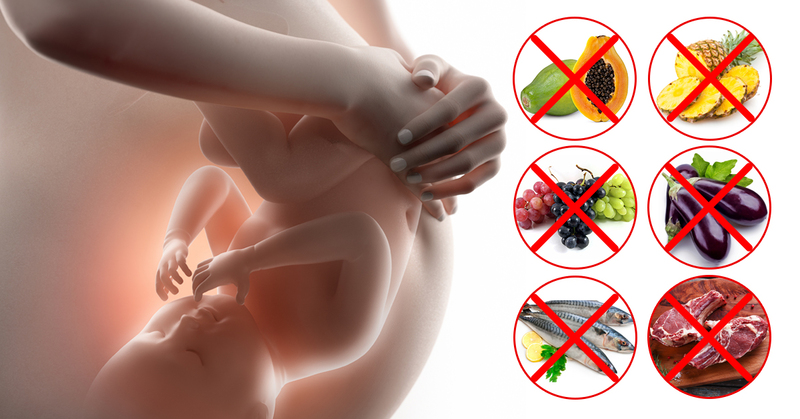 Papaya is proved to be very dangerous for pregnant women as it is said to stimulate abortion. Unripe papaya has many elements that cause contractions and restrict foetal growth. Ajinomoto is an ingredient that is used in households as well as restaurants particularly for Chinese food preps. It is advised to avoid its consumption as it affects the brain development of the foetus. Pineapple can cause labour issues and miscarriages as it softens the cervix. It also causes body heat that can lead to premature birth or abortions. Avoid packaged and readymade foods as they contains preservatives that can harm the baby. Try to stay away from refined flour like bread, pizzas and pastas as well to keep distance from harmful preservatives. Grapes should be avoided because it results in many complexities as it causes body heat. Grapes cause hormonal imbalance and stomach related problems. Try to stay away from these foods to have a safe pregnancy and keep yourself and your baby healthy.